I was pondering some fresh ideas for spring, one including the lovely ginkgo tree, and I decided to see who else had been inspired by this striking dinosaur. To start us out, I thought I'd share one of the many lovely works by the artist of ginkgo. 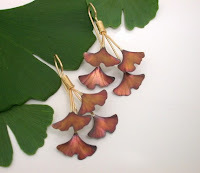 I love the little bunches of copper leaves so delicately hung. Simple, yet striking. 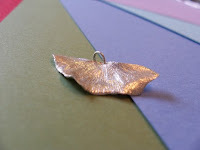 And now, the lovely, pure silver ginkgo charm by the equally lovely MeridianStudio. All of her pieces are individually crafted, never cast, so you know you're getting a one-of-a-kind piece every time. 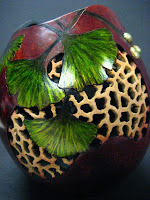 Next, the amazing filigree carved ginkgo gourd by trestella. This gorgeous piece definitely speaks for itself! The colors and textures are just wonderful.